Bentonite is an absorbent clay consisting mostly of the mineral montmorillonite. It is formed by the weathering of volcanic ash, most often in the presence of water. Chemically, it is an impure form of aluminum phyllosilicate. The formula of montmorillonite may be written as (Na,Ca)0.33(Al,Mg)2Si4O10(OH)2·(H2O)n. There are two types of bentonite: sodium bentonite, also called swelling bentonite; and calcium bentonite, also called nonswelling bentonite. Bentonite is useful for a wide range of applications. For instance, sodium bentonite is used in drilling mud for oil and gas wells, in sealing subsurface disposal systems (such as for spent nuclear fuel), and in preventing metal pollutants from entering groundwater. Calcium bentonite is sold as an agent that cleanses the intestinal tract. In addition, bentonite is used in cement, adhesives, ceramic structures, cosmetics, and cat litter. It may also be used in pyrotechnics to make end plugs, and in therapeutic face packs for treating acne. Sometime after its discovery around 1890, this absorbent clay was named after the Benton Formation (a geological stratum at what was Fort Benton) in Wyoming. Montmorillonite, discovered in 1847, was likewise named after its place of discovery in Montmorillon in the Vienne prefecture of France, in Poitou-Charentes, South of the Loire Valley. Most high-grade commercial sodium bentonite mined in the United States comes from the area between the Black Hills of South Dakota and the Big Horn Basin of Montana. Sodium bentonite is also mined in the southwestern United States, Greece, and other parts of the world. Calcium bentonite is mined in the Great Plains, Central Mountains, and southeastern regions of the United States. Sodium bentonite expands when wet and can absorb several times its dry mass in water. It is mostly used in drilling mud for oil and gas wells and for geotechnical and environmental investigations. The property of swelling also makes sodium bentonite useful as a sealant, especially targeted for sealing subsurface disposal systems for spent nuclear fuel and for quarantining metal pollutants of groundwater. Similar uses include making slurry walls, waterproofing of below-grade walls, and forming other impermeable barriers—for example, to plug old wells, or as a liner in the base of landfills to prevent migration of leachate into the soil. The nonswelling calcium bentonite (commercially known as Pascalite) is sold in the alternative health market for its purported cleansing properties. It is usually combined with water and ingested as part of a detox diet, in a practice known as geophagy. It is claimed that the microscopic structure of the bentonite draws impurities into it from the digestive system, which are then excreted along with the bentonite. It is also claimed that native tribes in South America, Africa, and Australia have long used bentonite clay for this purpose. Calcium bentonite may be converted to sodium bentonite and exhibit sodium bentonite's properties by a process known as "ion exchange." Commonly, this means adding 5-10 percent of sodium carbonate to wet bentonite, mixing well, and allowing time for the ion exchange to take place. Much of bentonite's usefulness in the drilling and geotechnical engineering industry comes from its unique rheological properties. Relatively small quantities of bentonite suspended in water form a viscous, shear thinning material. Most often, bentonite suspensions are also thixotropic, although rare cases of rheopectic behavior have also been reported. At high enough concentrations (about 60 grams of bentonite per liter of suspension), bentonite suspensions begin to take on the characteristics of a gel (a fluid with a minimum yield strength required to make it move). For these reasons it is a common component of drilling mud used to curtail drilling fluid invasion by its propensity for aiding in the formation of mud cake. Bentonite can be used in cement, adhesives, ceramic bodies, cosmetics, and cat litter. Fuller's earth, an ancient dry cleaning substance, is finely ground bentonite, typically used for purifying transformer oil. 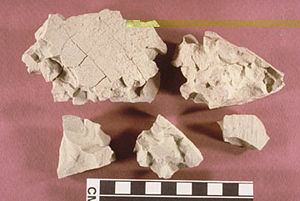 Bentonite, at low percentages, is used as an ingredient in commercially designed clay bodies and ceramic glazes. Bentonite clay is also used in pyrotechnics to make end plugs, and it can also be used as a therapeutic face pack for the treatment of acne or oily skin. The ionic surface of bentonite has a useful property in making a sticky coating on sand grains. When a small proportion of finely ground bentonite clay is added to hard sand and wetted, the clay binds the sand particles into a moldable aggregate known as green sand used for making molds in sand casting. Some river deltas naturally deposit just such a blend of such clay silt and sand, creating a natural source of excellent molding sand that was critical to ancient metalworking technology. Modern chemical processes to modify the ionic surface of bentonite greatly intensify this stickiness, resulting in remarkably dough-like yet strong casting sand mixes that stand up to molten metal temperatures. The same effluvial deposition of bentonite clay onto beaches accounts for the variety of plasticity of sand from place to place for building sand castles. Beach sand consisting of only silica and shell grains does not mold well compared to grains coated with bentonite clay. This is why some beaches are so much better for building sand castles than others. The self-stickiness of bentonite allows high-pressure ramming or pressing of the clay in molds to produce hard, refractory shapes, such as model rocket nozzles. Indeed, to test whether a particular brand of cat litter is bentonite, simply ram a sample with a hammer into a sturdy tube with a close-fitting rod; bentonite will form a very hard, consolidated plug that is not easily crumbled. Bentonite also has the interesting property of adsorbing relatively large amounts of protein molecules from aqueous solutions. It is therefore uniquely useful in the process of winemaking, where it is used to remove excessive amounts of protein from white wines. Were it not for this use of bentonite, many or most white wines would precipitate undesirable flocculent clouds or hazes upon exposure to warmer temperatures, as these proteins denature. It also has the incidental use of inducing more rapid clarification of both red and white wines. ↑ The Slurrying Test in the Äspö HRL, SKB, 2007. Retrieved May 24, 2007. ↑ Hydraulic behaviour of bentonite based mixtures in engineered barriers: The Backfill and Plug Test at the Äspö HRL, Universitat Polytecnica de Catalunya, 2007. Retrieved May 24, 2007. ↑ Bentonite, About.com: Alternative Medicine, 2007. Retrieved May 24, 2007. ↑ Bentonite clay for internal healing, healingdaily.com, 2007. Retrieved May 24, 2007. Klein, Cornelis, and Barbara Dutrow. 2007. Manual of Mineral Science. 23rd ed. New York: John Wiley. ISBN 978-0471721574. Pellant, Chris. 2002. Rocks and Minerals. Smithsonian Handbooks. New York: Dorling Kindersley. ISBN 0789491060. Shaffer, Paul R., Herbert S. Zim, and Raymond Perlman. 2001. Rocks, Gems and Minerals. Rev. ed. New York: St. Martin's Press. ISBN 1582381321. All links retrieved June 2, 2016. Beidellite Mineral Data. – Webmineral.com. Montmorillonite Mineral Data. – Webmineral.com. This page was last modified on 2 June 2016, at 16:05.